The Institute of Technology Tralee (IT Tralee) is the most recent member of the consortium. IT Tralee was established in 1977 as the Regional Technical College, Tralee and in 1992 became the Institute of Technology, Tralee. The Institute currently has 3,500 full & part-time students, employing 350 staff and provides a financial contribution of circa €60m to the local economy annually. The Institute has three principal schools, i.e. School of Business, Computing & Humanities, School of Science, Technology, Engineering & Mathematics and School of Health & Social Sciences and offers programmes in a number of areas including Agriculture, Biological & Pharmaceutical, Business & Management, Construction, Creative Media, Engineering, Environmental, Food, Culinary Arts & Cookery, Health, Leisure & Fitness, Hospitality & Hotel Management, Information Science/Systems, Music, TV & Radio, Nursing, Outdoor Activity, Renewable / Energy, Social Sciences, Computing & Technology, Tourism & Wildlife. The Institute also has a number of research centres: Centre for Entrepreneurship and Enterprise Development, Shannon Applied Biotechnology Centre, Irish Academy of Hospitality & Tourism, Intelligent Mechatronics and RFID, UNESCO Chair in Inclusive Physical Education, Sport, Fitness and Recreation. The Research Office at IT Tralee manages the Institute’s valuable intellectual property (IP) portfolio arising from its research activities and facilitates the technology transfer of potentially commercially valuable IP into the hands of Industry. 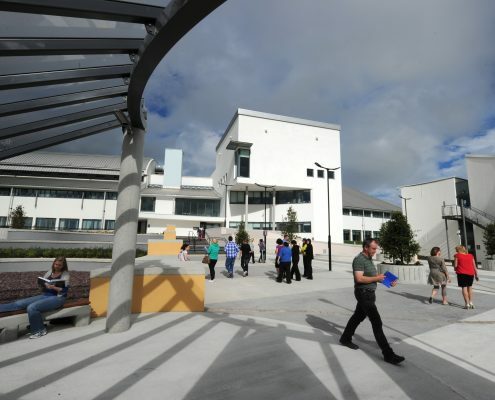 In addition, the Tom Crean Business Incubation Centre plays a key role in fostering and developing the entrepreneurial mindset as part of the innovative ecosystem of the Institute of Technology Tralee and where successful start-ups can move to the Kerry Technology Park who share our 113 acre North Campus.